The Traditional Flavour of the Meadowlands. The FISAN Acorn-Fed Loin is characterised by its mellow flavour, its marbled texture and its profound aroma. 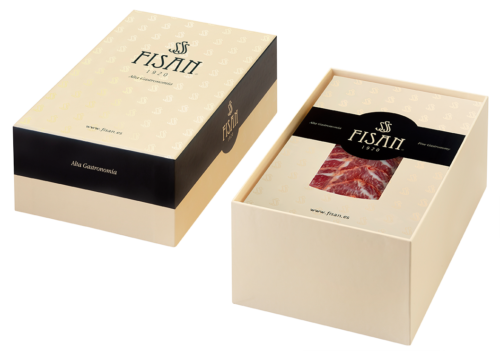 This loin is made with a traditional marinate, based on pimentón (paprika) and the meat is never frozen during its production. Pain-staking curing takes place in natural cellars during a minimum of six months. It is 100% natural. Colour: lean pink-red purple with rosy hued white fat marbling. Between 1,2 and 1,7 Kg.